It feels like I made this recipe about three weeks ago, the day has seemed that long. But in fact, it was only just over twelve hours ago when I decided that I'd capitalise on Miss A being poorly and get my recipe done and dusted before she woke up. Having failed to check out my final Ocado order on Thursday, I found myself entirely lacking in the fruit and veg department. Not good when you decide to go on yet another healthy eating jag because your husband shows you a picture of you when you were twelve weeks pregnant and says 'Wow, you used to be so slim then'. Not knowing if I'd be able to leave the house or not, I figured I'd best try and come up with something quick and healthy to cook that didn't require fruit and veg. I've probably lost and gained nearly as many pounds as I've cooked hot dinners, having gone from 16.5 stones down to 10.5 stones and wavered between there and 12.5 stones ever since (apart from tipping the scales at 15.5 stones the day before I sprogged). I know the healthy eating regime that used to work for me. Eat little and often. Do lots of exercise. Unfortunately I find it hard to do the latter these days due to the time constraint of a full time job, having a child and only being able to exercise if I get up at about 4am. Plus, with my new found love of home made things, I am trying to shy away from the 'low fat' shop-bought food that once crowded my diet. So I need to look for things that are tasty, use (mostly) ingredients that 'know where they've come from' and eat them little and not too often. I seem to remember reading somewhere that oatcakes with hummus or low fat cream cheese is an acceptable low fat, filling mid-morning or -afternoon snack and so I figured I'd have a look at making my own. I've never really taken to shop-bought ones, finding them even more akin to eating cardboard than I do Ryvita. But based on my experience of making my own very tasty Rye Crispbreads the other day, I thought I'd give these a whirl too. It's one of those lovely simple recipes that once you've made it once, you'll be able to remember the ingredients off by heart next time. Oats, salt, olive oil, boiling water. Simple. I made a slight change to the recipe as I have given up buying fine oatmeal (I used to use it in my homemade granola). Now I just grab handfuls of oats and crush them up myself. It's really easy to do - you don't even need to dirty the blender - and it's one less random packet of open stuff in the cupboard that is at risk at spilling its contents everywhere. The mixture is quite 'thirsty'. At first, I added the water carefully. Then I added what I thought was too much. And being it was too early in the day to follow Hugh's advice and let the dough rest 'for as long as it takes to open a bottle of wine and pour a glass' I left it for 30 seconds to make a cuppa and suddenly it was no longer sticky. It's quite a firm dough as I then found out when I managed to bend the handle on my expensive, yet flimsy M&S pastry cutters. I would've also made plain round ones instead of fluted ones, had Miss A not decided it would be fun to hide all of the normal cutters around the house. If I'd thought it at the time, I could've just made little squares or rectangles. Or even triangles. I might do that next time. The recipe also instructs you to cook them for twenty minutes. Of course as luck would have it, Miss A decided to get up after mine had been in for five. They ended up being baked for thirty-five minutes. I was worried that they'd burn, but thankfully they just had a lovely toasted, digestive-y flavour to them. Definitely worth taking the time to make your own. 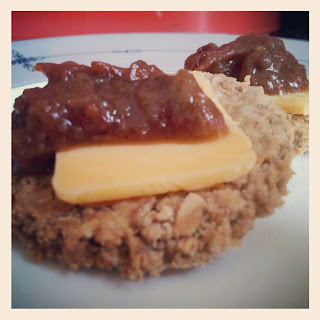 I served myself two for my mid morning snack with a tiny sliver of Double Gloucester (7g split between two biscuits) and a spoonful of Chilli Jam on top. A lovely, filling, tasty snack for 250 cals. I only made half the quantity as I wasn't sure I'd like them but I'll definitely be making these again. Diet food? Doesn't taste like it! Place the oats in a large bowl. Using your hands (wash them first! ), scrunch the oats up so that roughly 50% of it is finely ground. This will help bind the biscuits together. Stir in the salt and pepper, then make a well in the centre and add the oil. Mix to combine then add just enough boiling water to make a soft and slightly sticky dough. Rest for a minute or two then turn out onto a floured board and roll to about 5mm thick. Cut into sixteen pieces either using a knife to make squares or triangles; or use a plain 6cm cutter. 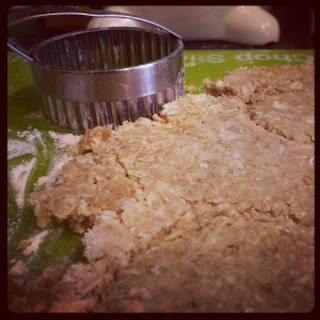 If you need to re-roll the scraps, you might need to add a dribble more water as the dough becomes drier once it's been on the floured board. If so, don't forget to rest it for a minute before re-rolling and further cutting. Bake for 30 minutes before cooling on a wire rack. Store in an air tight container. By my calculation (using MyFitnessPal.com) these are about 100 cals each and worth every calorie. These look ace. But then anything by Hugh FW generally is. Unsurprisingly, Dan Lepard's oatcake recipe in S&S is also very good if you haven't tried it already. Ha ha. It never occurred to me to look in Short and Sweet :) Now I'm going to have to try them!